through the islands. 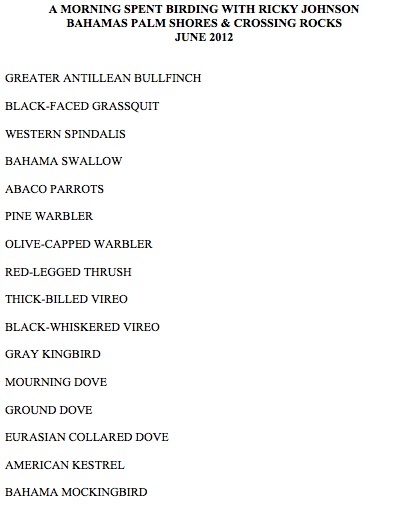 Bahamas Endemic Bird Area (EBA) restricted-range birds total seven extant species. The Bahamas EBA includes the Turks and Caicos Islands (to the UK) with which the Bahamas share four of the restricted range birds, namely Bahama Woodstar Calliphlox evelynae, Bahama Mockingbird Mimus gundlachii, Pearly-eyed Thrasher Margarops fuscatusand Thick-billed Vireo Vireo crassirostris. Of the remainder, Olive-capped Warbler Dendroica pityophila occurs also in Cuba, but Bahama Yellowthroat Geothlypis rostrata and Bahama Swallow Tachycineta cyaneoviridis are endemic to the islands. 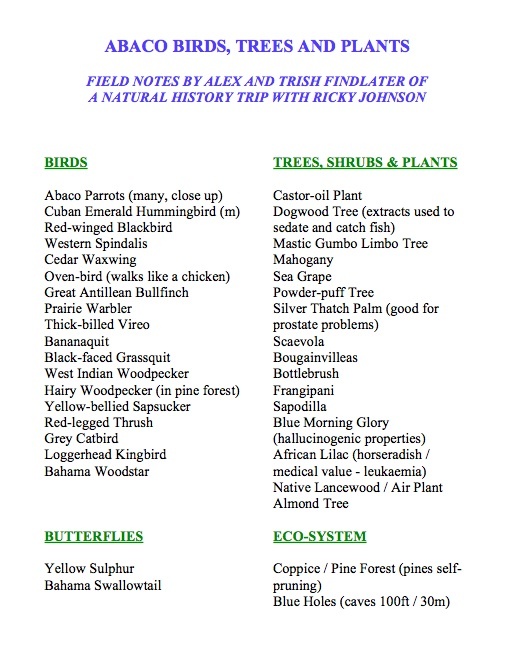 The yellowthroat is common on Grand Bahama and Abaco, less common on Andros and Cat Island, uncommon on New Providence and non-existent on the other islands. The swallow is locally common and breeds on Grand Bahama, Abaco and Andros, less common on New Providence, and uncommon to non-existent in the central and southern Bahama Islands. 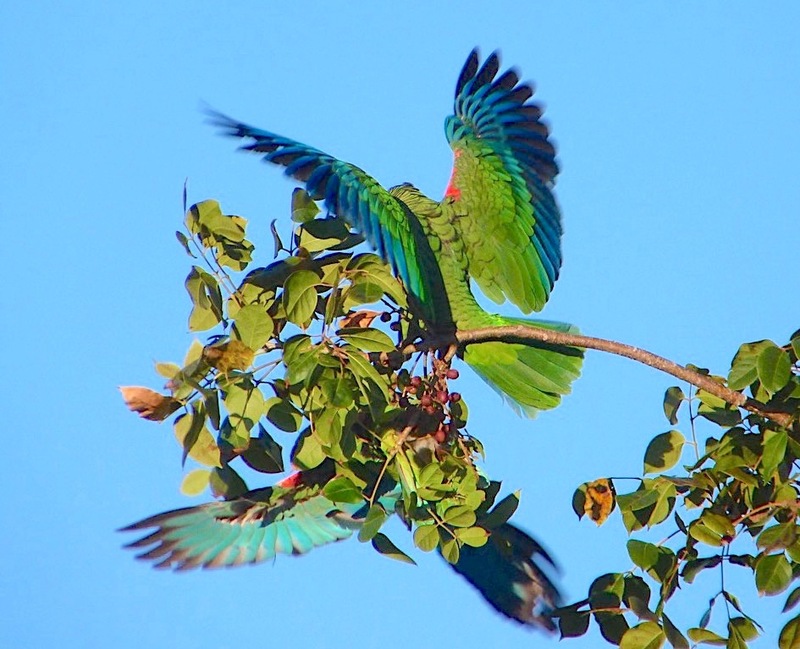 An eighth restricted-range bird (and third national endemic) was the Brace’s Emerald Cholorostilbon bracei which is now extinct. It was known only from a single specimen collected in 1877. 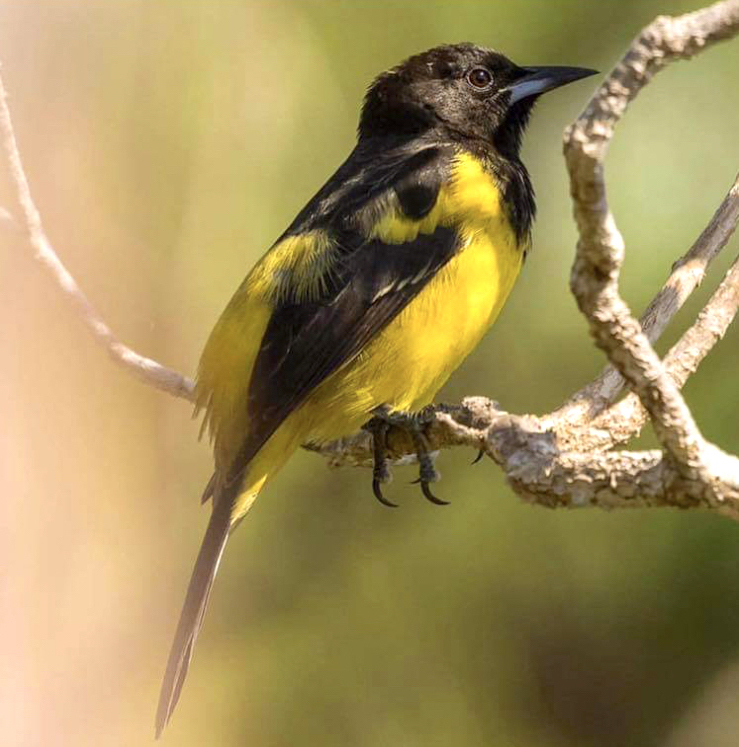 The Bahama Oriole Icterus northropi (formally classified as a subspecies of the Greater Antillean Oriole,Icterus dominicensis northropi) is found only on Andros (where it is threatened), having been extirpated from Abaco. Globally threatened birds in the Bahamas include the Vulnerable West Indian Whistling-duckDendrocygna arborea and Tachycineta cyaneoviridis, and the Near Threatened White-crowned Pigeon Patagioenas leucocephala, Cuban Amazon Amazona leucocephala bahamensis, Piping Plover Charadrius melodus and Kirtland’s Warbler Dendroica kirtlandii.Dendrocygna arborea only occurs on Andros, Inagua, Cat Island, Long Island and Exuma where significant numbers occur in a few areas (such as Hog Cay off Long Island). The species is protected by law under the Bahamas Wild Birds (Protection) Act. Tachycineta cyaneoviridis relies on pine forests for breeding, but the movements of the species outside the breeding season are poorly known although it appears that significant numbers over-winter in the country. Patagioenas leucocephala is a target for recreational hunting, but poaching and excessive hunting is common because although laws exist for the species’ protection, enforcement is inadequate. 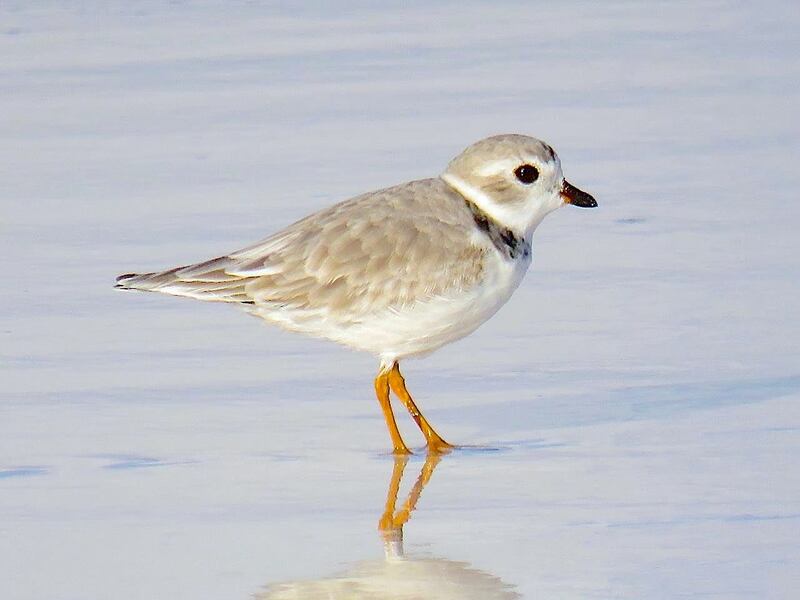 Charadrius melodus is an uncommon winter resident in the Bahamas although some specific beaches and tidal flat areas (which need to be designated as protected areas) do support significant numbers. Eleuthera supports the largest population of wintering Dendroica kirtlandii currently known, and is the focus of a multi-institutional initiative, the Kirtland’s Warbler Training and Research Program. Over 14 species of seabirds breed in the Bahamas, but their preferred habitats of isolated cays with steep cliffs or rocky shorelines, and with low vegetation near to deep water, are being lost due to increased human uses of coastal areas through resort developments, disturbance, and increased pollution of near-shore waters. Seabird eggs (and adults) are also collected. Recent (2002–2006) surveys in the Northern Bahamas identified over 60 seabird breeding locations in Grand Bahama, Biminis, Berry Islands and Abacos showing just how important these northern islands are for their seabird populations. The Bahama islands are of great importance to wetland birds, but their usage of individual wetland sites varies seasonally and between years depending on weather and local conditions. This suggests that a network of protected wetland sites is critical to the long-term viability of the nation’s waterbird populations. Large numbers of migratory shorebirds use these wetlands as stop-over sites and as wintering grounds, as do ducks and significant numbers of resident egrets and herons and other species. 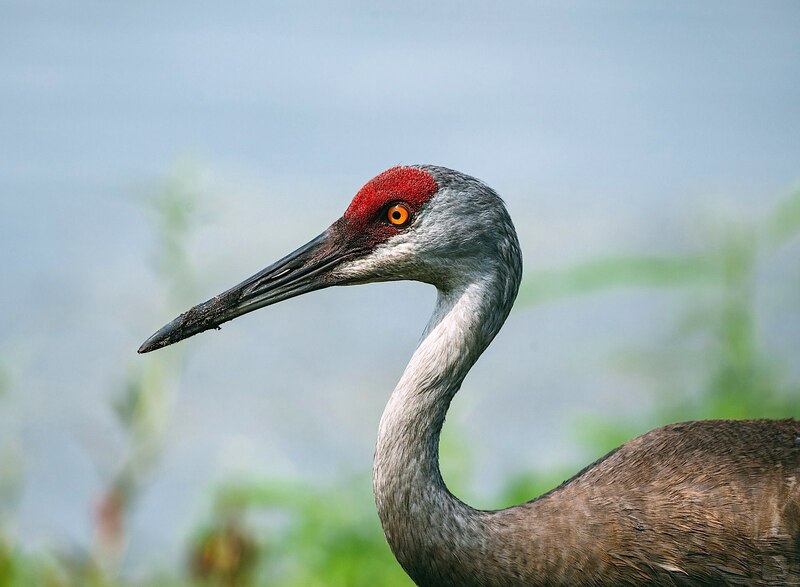 However, these waterbirds face many threats including draining and infilling of wetlands, contamination of food supplies, oil spills, introduced mammalian predators, disturbance, and hunting. 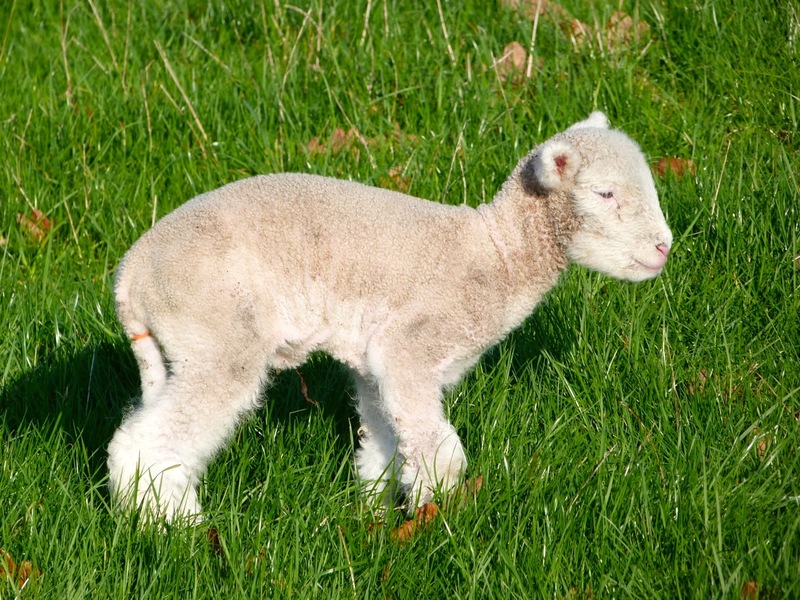 However, conservation efforts can have a profound impact. In 1905, the National Audubon Society (BirdLife in the US) requested the Government of the Bahamas to provide legal protection for the Caribbean Flamingo Phoenicopterus ruber. The government responded by passing the Wild Birds (Protection) Act. An initial attempt to save the flamingo breeding colonies on Andros failed in the 1950s, but a research program was established and a colony was discovered on Great Inagua. A 99-year lease was agreed, the Inagua National Park was established, and the flamingo colony (over the next 40 years) increased from less than 10,000 birds to over 40,000. Conservation of birdlife in the Bahamas has been concentrated on a few high-profile species such as the Caribbean Flamingo Phoenicopterus ruber, West Indian Whistling-duck Dendrocygna arborea, “Bahama Parrot” Amazona leucocephala bahamensis, White-crowned Pigeon Patagioenas leucocephala and Kirtland’s Warbler Dendroica kirtlandii. However, more attention is now being paid to critical sites (such as IBAs) and habitats (such as the dry forests) as well as the species themselves. If anyone would like to be on the mailing list for these regular reports – invaluable for up-to-date information about species and locations – let me know. 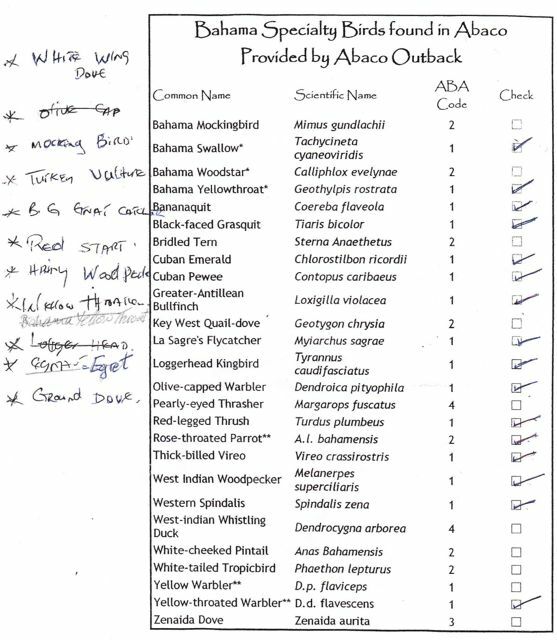 The annual South Abaco bird count took place in mid-December. The birding group was split into two parties. Janene Roessler has kindly sent me the ‘score sheet’ for her party. The results are very interesting, not least because of 114 target species for the season, they saw 55 – very close to 50%. 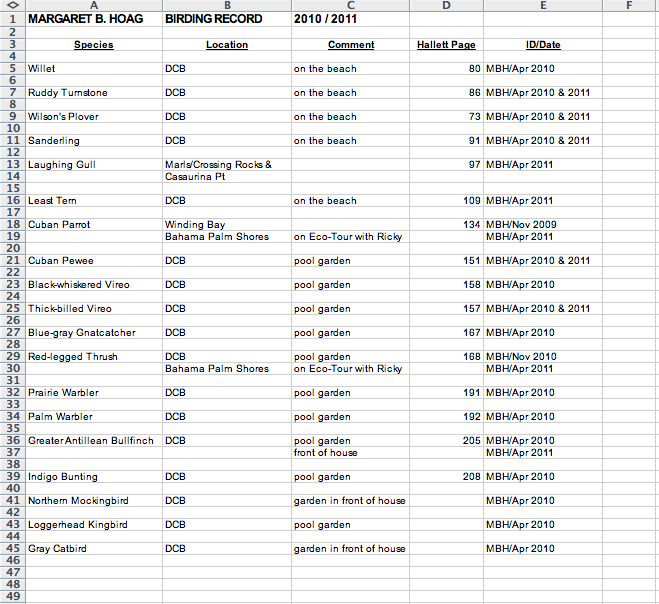 Click on the link below to see the complete record of the birds ticked off on the count sheet. I am hoping to get the data for the other party. It will be interesting how the two groups and their count totals compare. When I get the details, I’ll add them here.